Despite the lack of unnecessary singing (in this episode), Riverdale’s return—and so much of season two—feels so greatly like Glee meets One Tree Hill that it’s frustrating. Obviously, no one expects Riverdale to feel “real” or even all that grounded in reality. But that’s because it thrives on the surreal, which is much different from poor or nonsensical storytelling. Poor and nonsensical storytelling, unfortunately, is the name of the game here. Archie and the damn FBI; Veronica and her increasingly uninteresting connection to her parents’ business; Betty and her long-lost brother; Cheryl and her prostitute mother; Josie and her very lack of being. To compare it to a soap opera would be insulting to both soap operas and the general understanding of what can work in a teen drama. 1. FBI Agent Adams is a legitimate FBI agent. Even Jared Padalecki or Jensen Ackles would have sold it more. 2. Agent Adams is even a real person and not just figment of Archie’s PTSD-induced imagination. 3. Riverdale hasn’t just completely given up and decided to be Twin Peaks but bad. The knowledge of Nick St. Clair’s status argues against the imaginary thing, but considering where we’re at with Riverdale right now, does anyone care enough to make this make sense? Regardless of any of these points, I’d argue it’s still fair to say Archie has been in dire need of therapy since the first season, and that would be a far more compelling storyline than this or any he’s had so far. However, therapy would also require the show’s acknowledgement of Archie as more than a surface level character, and Riverdale still appears to be frighteningly unable or unwilling to do that. To say Archie the comic character is completely surface level is understandable and honestly kind of part of the joke; but on a show where so much is happening, it doesn’t play well for one character to be so greatly… nothing. However, it could be worse, as he could be Principal Weatherbee. Weatherbee certainly proved to be an ineffectual leader in the Red Circle episodes, but here, his incompetence is staggering. He’s a puppet, but we don’t even get to see how he reacts to being a puppet. An explanation would be nice, considering how poorly he runs his school. You have the graffiti in the hall, with Veronica very clearly pointing out that Reggie is playing Weatherbee—but Weatherbee instead takes this as the time to ban all things Serpents. That makes some sense (gang imagery and all), even though he still refuses to investigate. So the Serpents (minus Jughead) follow orders, only to get into trouble again for defending Jughead from Reggie, who has an overly emotional reaction to seeing a Serpents jacket. So Reggie is now two for two when it comes to instigating these situations with Southside transfers, and Weatherbee does nothing. Then, after Veronica’s very “missing the point” idea to set up a “charitable donation to help out the fashionably misguided,” the Southsiders are forced to wear school uniforms. 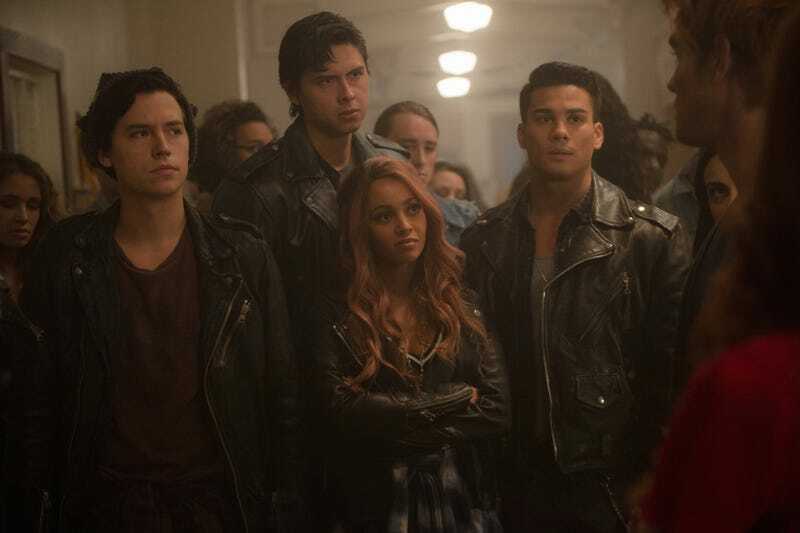 With Weatherbee’s rationale supposedly (this happens offscreen) being that the Southsiders must not have the financial means to have Riverdale High appropriate clothing. Keep in mind, the Serpents followed the rules and wore other clothing. Sweet Pea even started wearing turtlenecks to hide his tattoos! Then, Fangs is suspended for not wearing the uniform, despite playing ball with the previous wardrobe request. So, following the understandable dress code up with a uniform that only certain students are required to wear? I believe this is where the word “optics” comes in, and they don’t look great. Then history repeats itself, as Weatherbee sanctions a club that is so very clearly a way for the Serpents to be Serpents during school hours that it makes no sense he even fought their existence in the first place. So what has been accomplished here, on either side? Other than an inevitable lawsuit against Weatherbee and the school board? With Jughead, his role as a Serpent leader makes sense. Except for when he tries to pretend he knows more about the Serpents than his friends who have been part of the tribe for much longer and his father, the king of the Serpents (and of Pop’s). While Jughead wants to fight for what he thinks is right in this episode, it’s so obvious that he’s also in the wrong and disappointing he doesn’t find a solution to stop the unfair aspects of the dress code. In fact, the way Jughead acts when it comes to the Serpents (may he never say “skins” again), you’d think he’s the one in a cult. The problem with that, however, is that he’s the only Serpent who acts this way. 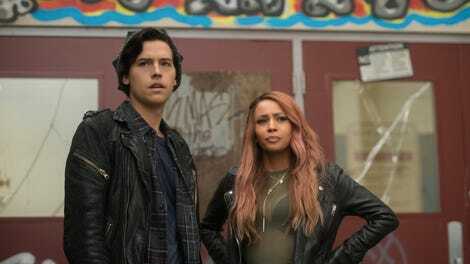 The best thing in the Serpents’ favor in this episode—and something Jughead doesn’t understand—is how much they actively want to succeed in this new environment. The shining light of this episode is when Toni and Sweet Pea say how much they don’t care about the wardrobe banning, because they’re just pumped they finally have a good and safe school. If only Riverdale cared to depict the inner workings of the Serpents from the perspective of someone other than Jughead. Because Jughead, bless his heart, grew up having these things and almost takes them for granted as much as Archie does, despite his Southside lineage. As for Cheryl, this season began with her taking back the cheerleaders (resetting the Riverdale High power dynamic) and having control over her mother… and that ended up meaning nothing, didn’t it? The mental whiplash that comes with trying to understand why Cheryl acts the way she does has always been part of the character, but now there’s less method to the madness. What does she expect to happen if Archie and Veronica are on her side against the new students? That’s never explained, just like the episode doesn’t go deeper into the fact that this is a character who is vehemently opposed to integration. Because while it’s one thing to root for Toni to knock the disrespect out of Cheryl upon meeting her, this episode refuses to let anyone call Cheryl the bad guy. She tries to blackmail Archie—a point that’s only addressed again when Archie tries to save himself—but then we’re supposed to feel for her because of what she went through with Nick. And Archie is her knight in shining armor, only not, because he couldn’t care less about her. So are we supposed to care about her? She technically fills the place of a Cordelia Chase on this series, but the problem is, she never learns and is just an actively bad person the majority of the time. She doesn’t realize she’s the villain in a Dickens story. When in doubt, Riverdale resets, but it especially does that with Cheryl. She had a proper arc in the first season and showed signs of having more in this second season, but the signs have been nothing more. All she is now is soundbites, which is at least still more than Josie. But that’s a whole other problem. Meanwhile, Betty has no idea there’s a class war happening at school, because she’s too busy fighting the one at home. Enter her long lost brother, Chic (Hart Denton), the other prostitute on the show. And cue the One Tree Hill connection, as the words “Psycho Derek” practically flash over his head in the final scene of the episode. While Betty (and Alice) is generally one of the highlights of any episode, that is unfortunately not the case here. On the plus side, it looks like Polly joining a cult is Riverdale’s way of officially writing out a character who never really worked. (There’s no other reason Betty wouldn’t tell her parents “POLLY JOINED A CULT.”) Of course the girl who’s not all there when we first meet her and willingly drinks Blossom milkshakes joins a cult. On second thought, Betty Cooper does have a highlight in this episode, in her reaction to the baby names Juniper and Dagwood. However, her belief that Polly’s departure can essentially be “fixed” by a replacement, fully grown child is a worse idea than those names. “Chapter Twenty-Three: The Blackboard Jungle” is very clearly a reset episode for season two, but the pieces it’s putting together are so weak that they don’t help the season get out from its rut. The case for a shortened season really sticks out here, as the last thing anyone needed after the midseason finale was any more of this season. I’ve written about how the first couple of episodes of season two essentially functioned as resets post-season one, even if they didn’t quite work. But with Riverdale very clearly wanting to get away from how poorly-received the Black Hood story was, it’s going to have to do a lot of work. This episode proves that won’t be as easy as it sounds, and it really shouldn’t be; after all, the show went from arguably its best episode (“Chapter Twenty: Tales From The Darkside”) to two follow-up episodes that greatly failed to make everything come together. And now we have the promise of “back to basics,” which tends to be code for acknowledgement that a show messed up. Now to see if that approach actually works. Riverdale Roulette: I’m going to change things up this week by suggesting Riverdale season one. A serial killer is someone who kills three or more people. The Black Hood, failure that he was/is, only killed two. Also, considering the Black Hood’s only actual murder victims were teachers, Weatherbee better watch his back. The best bit in this episode is the fake-out that we were going back to Archie and his music, only for that to get sidetracked by an even more terrible storyline of FBI informant Archie. Thanks, Chekhov’s Garage! The sadness of Josie when she says “formerly of The Pussycats” is a moment of Ashleigh Murray doing 100% more for the character than the show does itself. Not only do we still have no good reason for the band to be broken up, it looks like the Josie/Cheryl plot that led to it might be dropped. Josie doesn’t look like she’s still a cheerleader—and we really never got a reason for her to be one at all—and Cheryl’s trauma never once leads her to talk to Josie or ask for help. Josie and Cheryl are also on the opposite side of this integration situation, so I wonder if the show has just completely given up on pretending they’re close friends who have anything in common.